The Luxury range of cookers are defined by their innovative Sabaf burners which cook your food 20% faster giving you more time to spend on your family and the things that truly matter. Time and energy saving Sabaf gas burner: The Luxury 4 Gas cooker is fitted with a Sabaf burner which cooks your food 20% faster and saves you gas, time and energy. Double Enamel Coated Strong Pot Support: The pot support on the Luxury 4 Gas cooker is double enamel coated to give you the assurance of stability as you cook and help you minimise spills and messes. Double Enamel Coated Burner Caps The burner caps on the Luxury 4 Gas cooker are double enamel coated to protect your cooker against rust and extend its functional life. 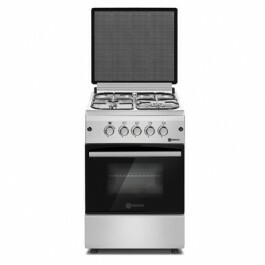 Top and Bottom Grill The Luxury 4 Gas cooker comes with a top and bottom grill to make sure that your food is thoroughly cooked quickly and effectively.